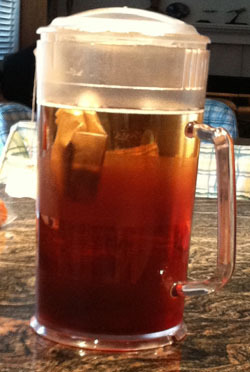 We drink a lot of ice tea at our house, especially in the warmer months. 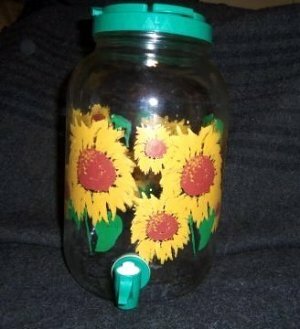 For many years we always use d one of those ubiquitous jars with a spigot. But we finally got tired of every one eventually leaking. I looked around on Amazon and found one that looked good. Unfortunately it didn’t last, nor did its replacement. So we picked up a pitcher at Bed, Bath and Beyond. It also gave up on us after not very long. Scratching our heads, Terry checked out practical, down-to-earth, plain-Jane Smart and Final. She bought two plastic but commercial grade pitchers. It’s been a couple of years now and they’re still doing the job and doing it well. Two of my Episcopal online resources, the Episcopal Café and the Episcopal News Service were writing about Communion and baptism in the Episcopal Church this week. Episcopal Café had multiple separate stories, including one by Jim Naughton and one by Theresa Johnson. Both focused on remarks made by Presiding Bishop Katharine Jefferts Schori at a town hall meeting in North Carolina early this year. ENS had a more detailed discussion of the subject, including mention of resolutions before the General Convention this year regarding whether baptism is required to receive Communion. That is the direction would like to see the Episcopal Church take. When we were looking at houses 15 years ago we drove down to Gilroy to see a new development called San Vicente. It was Easter Sunday and the sales office was closed. We came back the next Saturday and walked through the models. We decided that we liked the middle of the three sizes, and it was at a price we could manage. Just past the models there was an unfinished house of that size. We went in and spent some time wandering through the house. It felt right. We went back to the sales office and put down a deposit. One of the very first decisions we made was that Terry got the walk-in closet and I got the loft for my office and study. To this day my loft is a comfortable, safe space where I enjoy spending time. It is where I am as I type these words. I still take the time to be thankful and grateful for the gift.